iPad owners looking for an easy and temporarily way to mount their iPad devices onto a wall might be interested in a new creation called the MagStick which measures just 0.5 mm in thickness and provides a number of features and functions for iPad users and build s on a previous design also launched on Kickstarter back in 2013. 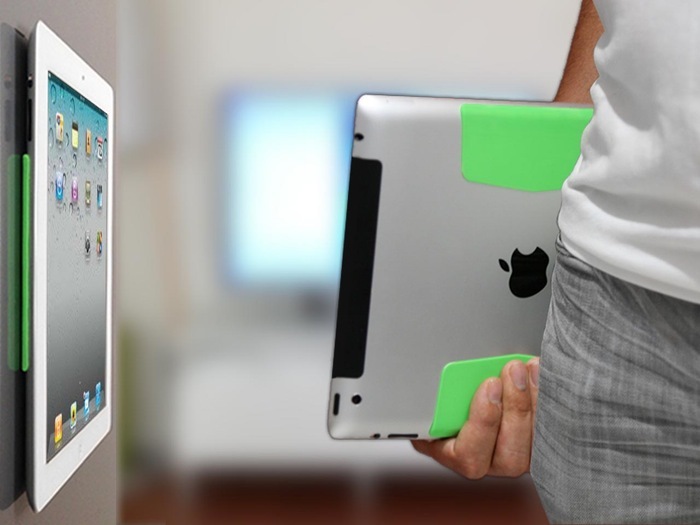 The MagStick iPad mount consists of two soft silicone pads attache to the back of the tablet that enable your iPad to be easily attached or detached from flat surfaces. Watch the video after the jump to learn more about this minimalist iPad mount solution and its features. As well as being able to mount your iPad to services the design also provides a way of keeping your smart cover neatly folded against the back of your iPad whilst in use, provides added grip when you are carrying your iPad and also provides a little protection in the process. If you would like to mount your iPad onto metal there is also a solution for this call the MagBack. The MagStick and MagBack project is currently over on the Kickstarter crowd funding website looking to raise enough pledges to make the jump from concept to production. So if you think the MagStick is something you could benefit from, visit the Kickstarter website now to make a pledge and help MagStick become a reality.